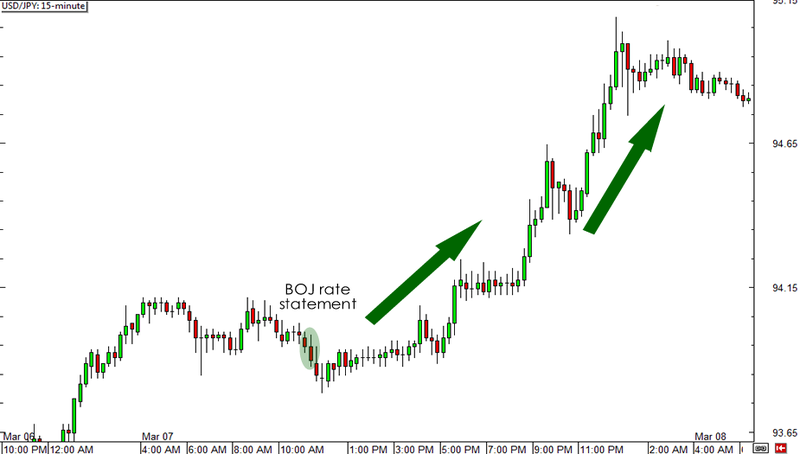 Yesterday, the Bank of Japan (BOJ) announced its decision on monetary policy. It was the last one for Governor Shirakawa and his two deputies as they leave the central bank on March 19, ending their 5-year terms. Because of this, analysts had expected the central bank to hold off announcing new stimulus measures until the new leadership takes over. As widely anticipated, there were no changes to both the bench mark interest rates (0.00%-0.10%) and the bank’s quantitative easing program. In fact, the BOJ even sounded slightly optimistic. Last month, the central bank only said that the rate of the economy’s weakening has somehow decelerated. Now, the central bank is saying that the economy has stopped worsening and has stabilized. BOJ member Sayuri Shirai somewhat surprised analysts though. Often neutral and known as a supporter of Shirakawa, she proposed that the central bank should start its open-ended asset purchases this year. But no one agreed with her. Haruhiko Kuroda, the head of the Asian Development Bank, will be installed as the next BOJ Governor. He’s going to take over on April 4. Known as an extremely aggressive dove, Kuroda is expected to implement major changes to monetary policy soon. After all, he did promise a few things for Japan that would require aggressive easing like increasing the BOJ’s inflation target to 2% and stabilizing the yen. He has also been a big critic of the BOJ and the way the central bank has handled monetary policy. He blames the BOJ for being too accommodative in the 1980s, and being too loose during the 2000s. Kikuo Iwata, one of his deputies, shares his sentiment. He has criticized the BOJ for actually supporting deflation, rather than trying to get rid of it. He recently said in a speech that the BOJ needs a regime change. Kuroda has already thought some of his plans through. Earlier this week, he made an appearance at Parliament and promised the Congress that, under his watchful eye, the BOJ would do “everything possible” to get Japan out of deflation. Although he didn’t give out a specific timetable, Kuroda estimates that the BOJ would be able to hit its sought-after 2% inflation rate in just 2 years. This is a pretty bold statement considering that Japan’s inflation rate has been bouncing off between -1.00% to 0.00% for the past 15 years. To do this, he plans on changing up the bank’s asset purchase program. Remember that the central bank currently has a 101 trillion JPY liquidity program which includes purchases of three-year bonds. The BOJ will soon start buying longer-term government and corporate bonds as well as exchange-traded funds. How soon? Sooner than markets previously thought. Kuroda feels that time is of the essence. Instead of waiting for the unlimited asset purchases program to start in January next year as previously announced, the BOJ will kick things off early. We’ll probably hear more about it in the bank’s next rate decision. The BOJ rate statement caused very little fanfare on the charts. In fact, USD/JPY actually traded lower following the decision. It didn’t last long though. After the pair hit 93.80, it skyrocketed past the 95.00 handle. Risk appetite contributed to the yen’s sell off. However, I can’t help but think that Shirakawa’s exit from the BOJ only intensified the move. I don’t know about you but I’m think we’re gonna see more USD/JPY rallies once Kuroda comes into office. What do you think of Kuroda?